The power to help create Mega Man Legends 3 is now in the hands of anyone with the ability to click. When the long awaited Mega Man Legends 3 was finally announced by Capcom for the Nintendo 3DS, there was a bit of mystery involved with its development process. Capcom's Keiji Inafune said that Mega Man fans would influence it somehow, but didn't reveal specifics. Now we know exactly how it'll work. Capcom announced the creation of the Mega Man Legends 3 Project community developer room today as the portal through which anyone can influence the creation of the game. Visitors to the website will be able to vote on various aspects of design and the most popular will make their way into the game. For example, the first vote taking place right now concerns Legends 3's heroine. 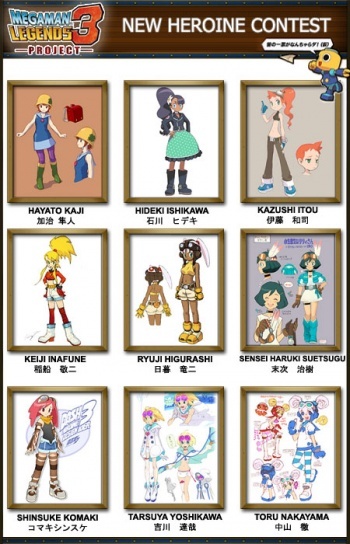 Nine designs have been submitted by popular Capcom artists including Mega Man creator Keiji Inafune himself. He'll be sad if you don't choose his. Each is accompanied by a message from the artist, so the developer room holds plenty of fan service. Will you choose the heroine with the poofy green dress or the girl wearing the helmet of classic enemy Met? It's all up to you. More features are said to be coming to the developer room in the future, so it may get even more involved than votes and forum discussions. This is a pretty cool way to let fans have an influence on Mega Man without totally ruining it.